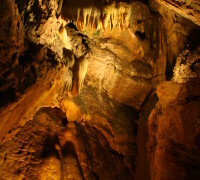 Geology enthusiasts are missing out if they haven’t visited Crystal Cave, an old and famous cave site in Pennsylvania. Crystal Cave was discovered in 1871 by William Merkel and John Gehret while they were looking for limestone. What they found instead was an underground cave full of beautiful sparkling crystals and rock formations. Take a tour with a knowledgeable and informative guide, which lasts just under an hour. You will be given an in-depth history of the cave while your are guided through it. At the end, see if you can remember the difference between a stalactite and a stalagmite. The tour also includes a brief movie. After the tour visit the museum or the rock and mineral shop, where many beautiful crystals and geodes can be purchased. In the summer months, the cafe and ice cream parlor is open for business. Crystal Cave’s “panning for gemstones” activity is fun for all ages. Purchase a bag of dirt and, just like panning for gold, see what treasures you can find! A miniature golf course is also located on the premises. Crystal Cave is open from March until November. The hours are 9am-5pm, with extended summer hours. As of March 2014, PaMidstate.com has been around for 15 years, can you believe it! It’s time for a change. We still have all your events, but now we are going to add profiles of places in the midstate that help you find that night out, on the town, at an exhibit, enjoying great food and drinks. There is no charge to get your business listed if it falls inline with the idea. Please contact me today and I’ll let you know what we need to get your listing here.